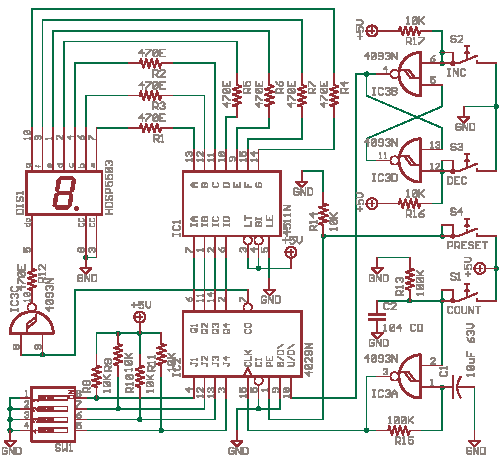 The basic digital circuits are Flip Flop and Counter, both are here. This circuit can be cascaded to make even a 6 digit event counter, even a simple frequency counter can be made. See the seven segment display. Inc, Dec, and Set buttons are momentary acting and Clk Button is latching type. The Dip Switch in the also can be set. a. - Set the DIP Switch as you like and then Press the Set button. The BCD value will be at the 4029 output, The Decimal value will be seen in the seven segment Display. Now try for different dip switch settings and see the BCD and Decimal output. b. - Now Press The Inc and Dec pushbuttons. Set it to Increment up-count or Decrement which is down-count. This is a simple flip flop control. c. - Now Click the Clk - clock or count button, the switch will latch, press it again to release. If you toggle it once the counter will get a single pulse and it will count it, see the BCD and decimal displays. Now you turn it on and leave it, the counter will keep counting one per second till you turn it off, the clock nand gate is wired to be an oscillator. The decimal point LED of display is given to Carry Out pin of 4029 so observe this at 9 and 0 or transitions. Add 104 CD, 0.1uF ceramic disc cap to all the ICs across the supply pins. Also add a 104 CD cap across Inc switch and one across the Set switch for power on default settings.